"I'm blessed to have two sons and they can really run the business," says Kyle Mathison of Wenatchee, Washington-based Stemilt Growers. "And then I can do what I do, which is to romance the trees." Kyle is part of the fourth generation of Mathisons to farm the land in the Wenatchee area, with his great grandfather having planted his first apple, pear and cherry orchards there in 1914. Kyle's father Tom Mathison founded Stemilt Growers in 1964 after becoming among the first cherry grower/packers in the United States to start employing modern cold chain practices. Tom gave Kyle the responsibility of running the pear and cherry side of Stemilt's operation in 1969 when he was 17 years old — and he's been "romancing the trees" ever since. Today, Stemilt is recognized as a leader in volume and quality for western US stone fruits and pip fruits. Its cherries, apples, pears and peaches are exported around the globe. Kyle Mathison is not only one of the owners of Stemilt Growers, but through his own orchards is also Stemilt's largest supplier of cherries and a significant apple supplier. Mathison is happy to let others take care of many of the details of sales and marketing, including his sons West and Tate, who are respectively Stemilt's President and Director of Sales. Talking with Mathison, it's clear that he is truly passionate about his fruit trees: part artist, part scientist, part spiritual guru for motivating all of Stemilt's growers and pickers to produce "world famous" fruit. "I believe in the moon," says Mathison, explaining that fertilizer absorption into the soil and nutrient uptake by trees is affected by lunar cycles. In his own orchards, when possible, he applies his special blend of compost in the new moon, "when there's the heaviest gravitational pull from the earth pulling the nutrition from the compost into the roots. And I believe in harvesting in the full moon, when the lunar gravity is pulling all the nutrition, flavors, aromatics up into the fruit." Amongst all the different fruits that Mathison grows himself and that Stemilt supplies, "I gravitate toward cherries," says Mathison. "They're the most delicate. An apple can stay overnight no problem without going into cold storage. But a cherry, I want 20 minutes from when it’s picked to when it’s hydrocooling. The metabolism of that cherry is very high, and so it's like a little ticking time bomb, burning those sugars." 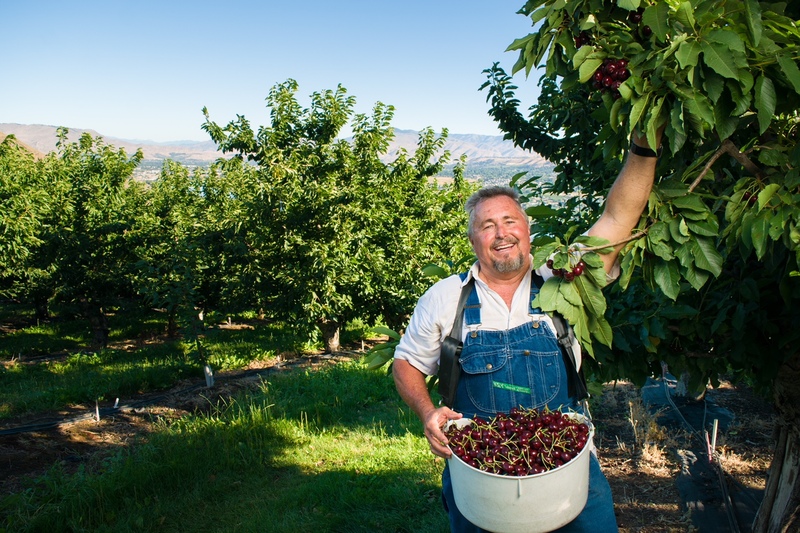 One of Mathison's biggest points of pride are he cherries he grows at high elevations, which supply Stemilt's 'A Half Mile Closer to the Moon' brand cherries. According to Mathison, cherries grown on mountain slopes at high latitude and elevations above 3,000 more closely mimic the environment of the mountains in Kazakhstan from which cherries originated, with large temperature swings between night and day, making for happier trees and sweeter, denser fruit. "My farm currently goes from about 600 feet of elevation at the Columbia River, up to about 3,500 feet," says Mathison. "My dream is to go up to 4,000 ft. At that elevation from 3,000 to 4,000 ft, that's where I want to be romancing my SweeTango apples, my Honeycrisp apples, my cherries." He adds that he hopes that growing organic apples at higher elevations will help him come closer to year-round supply due to the later harvest and denser cell structure that will allow organic Honeycrisp and Sweetango ® brand (Minneiska) apples to survive cold storage well past the current limit of June. The focus on organics is emblematic of what Mathison describes as a broader commitment to sustainability on the part of himself and Stemilt. Produce Report explained to Mathison that in China Stemilt is known as the "Beetle Brand" because of the ladybug used in its logo and asked him to share with our Chinese readership why the company chose this insect to be featured in its logo. "Because of my passion and my father's passion for organics and doing things the natural way, we plant beneficial predator gardens like wild roses and strawberries—plants that the ladybugs can live on—next to organic apple orchards," says Mathison. "Instead of making a chemical application for aphids, we want to use the ladybugs as the natural predator and eat the aphids. So the ladybug became our symbol of the core value that we want to do things with nature instead of using unnecessary chemicals."